Many of us know and eat sprouts as part of our daily diet. But, did you know that there is something called Alfalfa sprouts? 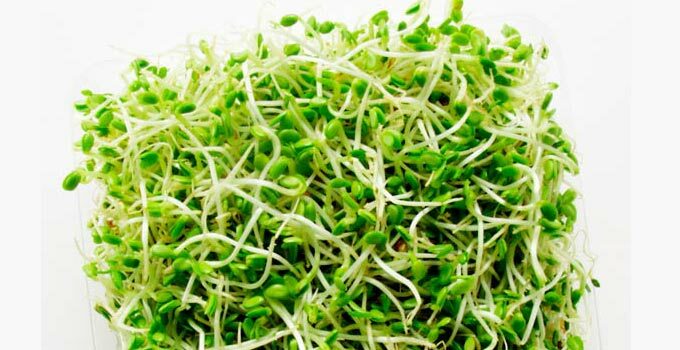 Alfalfa sprouts are derived from alfalfa seeds and is thin white thread like substance with a green tiny top. These sprouts are considered all season’s sprouts and hence can be eaten 365 days. Alfalfa is known for its tremendous health benefits such as being high in protein, calcium and other minerals, vitamins in the B group, vitamin C, vitamin D, vitamin E, and vitamin K.
Sprouting alfalfa seeds is the process of germinating seeds after which it becomes ready for consumption. It needs just water and a jar. Sprouting alfalfa takes three to four days with one tablespoon of seed which yields up to three full cups of sprouts. Alfalfa sprouts reduces the risk of heart disease, cancer and Osteoporosis and symptoms of menopause. It lowers LDL (bad cholesterol ) while increasing HDL (good cholesterol )and also helps boost immunity and gut system. Alfalfa sprouts should be thoroughly rinsed under running water and drained before eating them. *The rinsed alfalfa sprouts can be added to green salad or it can be layered into a lean turkey or chicken sandwich. *You can also top your burger with these sprouts. * Add them to a pita stuffed with hummus, tomatoes and bell peppers. *Roast them for not more than 30 minutes to prevent wilting to add in salad. Alfalfa sprouts are supposed to be consumed fresh. It can be refrigerated for maximum two to three days once you open the thin film on it. Avoid if it turns yellow in colour. It should be crunchy, white and fresh.